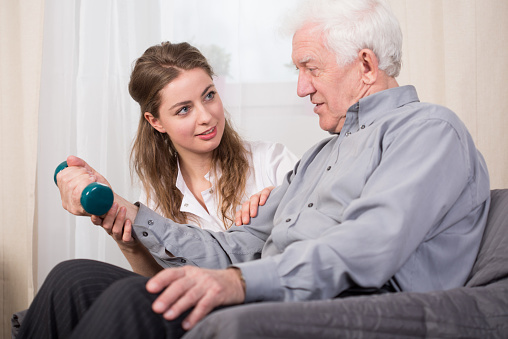 Home » Home Health Blog » What Types of Therapy Can I Receive In My Home? When most people think of therapy they think, “I have to go to s hospital like rehabilitation center,” or “I have to travel to an outpatient clinic that isn’t convenient to me”. However, this isn’t always the case. You can receive therapy service in your own home! Through our Medicare Home Health Services program, we can provide physical, occupational, speech and other therapies to meet your needs. Below are descriptions of each type of therapy we offer. Physical Therapy: Physical therapy is a type of treatment you may need when health problems make it hard to move around and do everyday tasks. It helps you move better and may relieve pain. It also helps improve or restore your physical function and your fitness level. The goal of physical therapy is to make daily tasks and activities easier. For example, it may help with walking, going up stairs, or getting in and out of bed. We can help create a plan for you to stay as independent as possible, in your home. Call us today for a free consultation, (314) 822-7958.